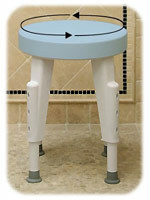 Handicap shower stools allow their users to safely sit on the seat and remove the strain of standing during a shower. Shower stools reduce the chances of slip and fall accidents in a shower too. As a person ages, bones will become brittle and more easily damageable. Slippery surfaces once considered fun to slide across as a child, are now an elderly person’s nightmare. If they should happen to slip and fall, the elderly could break a bone. Many times, the broken bone does not prove to be the largest problem. Instead, infection can set in and cause serious health problems. In some cases, complications from a slip can even cause death. Slippery areas are to be avoided if one is an elderly person. Often, an older individual might come to view his slick shower stall as a very dangerous place. No elderly person should be unable to safely take a shower in his own home. With the use of shower stools for seniors, however, an elderly individual no longer needs to lose the small daily triumph of showering on their own. The elderly can now sit down in their shower area with a shower stool. Below are the some of the best recommended shower seats and stools to buy. With a wide range of choices in material, strength, size and color, you are assured to find a shower stool that will meet your needs. Shower stools are made of teak, metal and plastic, all of which are rust resistant in a wet handicap shower environment. Teak is a strong heavy wood that can provide a dark yellowish brown color to your bathroom. If you are looking for dark wood shower stools, teak stools should meet your needs. Teak shower stools or wooden shower stools require very little maintenance and can be cleaned with some soap and water. Bamboo Shower Stools – Very durable and environmentally friendly. 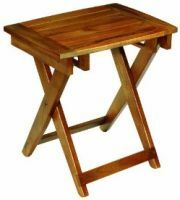 Foldable Teak Shower Stools – Solid wood with padded feet for slip free footing. 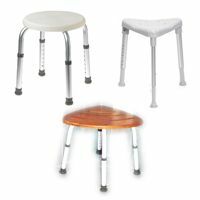 Rectangular Teak Stools – Flat teak surface with an aluminum base and scratch resistant feet. These plastic round shower stools are very durable and can handle weights up to 250lbs. The round and small size of these shower stools allows it to fit in any small bathtub or shower. Plastic round rotating stools also provide the ability to swivel, rotate and transfer while being in an enclosed tighter area; fitting in places where a regular chair cannot. They will not rust either. Although plastic and small, they are quite resistant to damage. With height adjustable legs and being portable, they are great for home use, travel or vacation. There are also stylish stools in rectangular, square, round and even corner shaped. Even with awkwardly designed bathtubs or showers, there are shower stools that fit any corner. For example, corner shower stools take up very little space if you have a square corner area. This corner shower seat fits in the corner and measures out 17 inches and has a width of 23 inches. 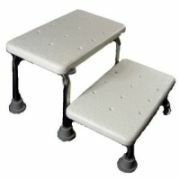 There are bariatric shower stools capable of supporting weights up to 400lbs to 550lbs. Pay careful attention to the weight limitations of the taller shower stools. Although, it is not always the case, the height adjustable stool legs will lose their strength, the longer you extend the legs. Shower stools can be lightweight and portable or bolted down to the ground as a permanent fixture to the shower area. These can take up very little space because you can fold them up against the wall. Other folding shower stools are not attached to the shower walls and work like a folding chair. The difference between a regular chair and a shower stool is the greater sitting space and seat holes for the water to drain through. This item has two benefits great for a bathtub environment. 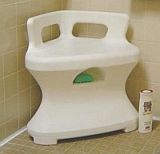 It has a step stool to assist those who have trouble getting over the bathtub curbs and can be used as a bathtub seat. One platform is for sitting and the other allows the user to rest their feet. Drainage holes allow water to leak through the seat and keep the surface dry. However, since typically shower stools lack a backrest, you might prefer a shower chair or a shower bench. Some people prefer to lean the bath stool up against the shower walls and use that as their backrest. This is up to your own seating preference. When purchasing a stool, take into consideration your troubles bending at your knees. Get a higher height so you put less strain on your body. This is not recommended for those who require bariatric stools. The strength of the stool legs is not something you can compromise on. If you need assistance getting up, position a shower grab bar near the seat to assist you when you sit down and stand up. Shower stools are usually sold to individuals who have the most trouble getting in and out of the shower like the elderly but they can just as easily serve as a convenient chair to sit in a bathtub for the elderly. In other instances, they are used by disabled people. Shower stools allow their users to safely sit on the seat and swing their legs around into the bathtub or shower stall. When they have completed the shower, they can swing their legs back around to safely stand up on the floor outside of the bathtub. Overall, shower stools prevent people from slipping and falling in the shower. As a result, these stools can save lives. Growing older does not mean that a person needs to give up his independence. With the use of a shower stool, an elderly person can stay clean without moving to a personal care home or without receiving sponge baths from a visiting aid. Ultimately, shower stools help the elderly and handicapped maintain a great deal of dignity.